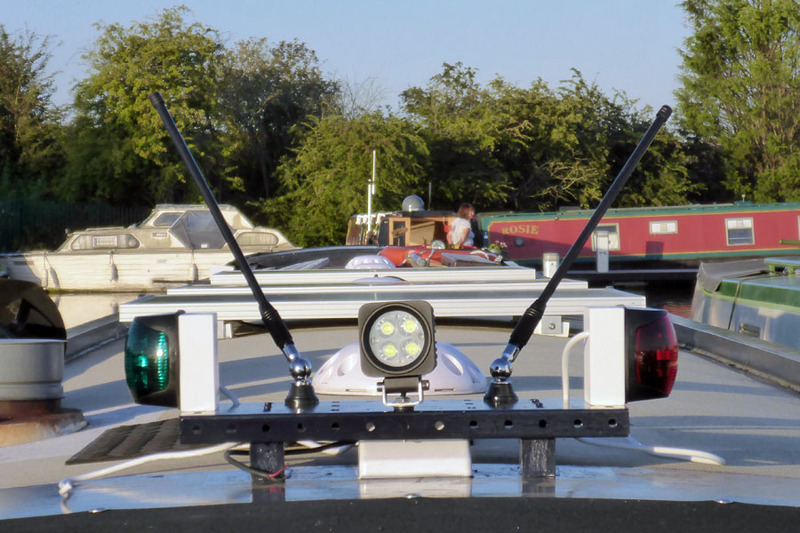 Navigation lights, LED tunnel light, auto-Taser antennae and satellite link system installed… – The Diesel-Electric Elephant Company. I just hope that the red and the green are on the correct sides! Yet to be fully hitched to the systems but all is in place now. New LED tunnel light, set slightly upwards and to the right… Rinky dinky navigation lights… Satellite link in its wee box… and probably the most giggle-inducing bit of all, two motorised auto-tracking 80,000 volt Tasers as part of the security system. Trigger any of the sensors and, if you’re within ten metres of the boat, I get an option on my mobile phone (whether aboard or abroad) to lay you out and fry your hairy arse with a wee bolt of electrickery through the aether. I cannot believe that these things (the two black “antennae”) are legal, but it seems so. Tally ruddy ho, chocks away, let me see your ne’er do well eyeballs (and suchlike) swivel. Similar systems to be fitted to the rear, on a rack with the rear nav light, anchor light, some uber-floodlights, the horn and two more antennae. Yes, yes, they do rather betray my sixties and seventies upbringing, with bearded, sandal-wearing music teachers and Hillman Imps and Caramac chocolate bars and “It’s frothy, baby!” Cresta in glass bottles… but I love ’em. How many ellipsesisies can a chap use in one blog post? Right, I must away and fill in the firearms licence questionnaire for the Tasers. There’s a paragraph in there about a cheque or Postal Order for ten shillings or something, payable to Her Majesty’s Constabulary. Then I must away to my bunk to contemplate negative space within an organic juxtaposition to strong polychromatic statements in portrait format. Or I may just dribble over some splodges of orange and grey and yellow. I love the smell of hot, smoking peasant. Oh my word! State of the art or what? I had one scary thought though – what if you get terribly terribly drunk and taser yourself? Is there a drunk safety button? I just wonder if the horse pulling the boat will know which side the red and green light should be on? Just a thought. Loving the progress, never realised that floating could be so high tech. Learnt something about registering the taser thingy with the polis, never new that! I’ll add that to my knowledge base for future reference – getting ideas again – nearly finished by seaside murder book. You do rather inspire me! The horse’s main worry is how the rear navigation light will be mounted… 😉 It’s comforting to know that I can still inspire folk to murder! “It’s frothy, man” I think. Whatever, I loved the strawberry one! I loved ’em all… gawds alone know what chemicals were in them. Drinking the stuff probably accounts for my toes glowing in the dark even all these years later.